. إن Sheraton Grand Mirage Resort, Gold Coast حريص على توفير الراحة للنزلاء، فلا يوفر الموظفون جهداً في تقديم أفضل الخدمات وضمان حسن الاستقبال. تتضمن الميزات الرئيسية في هذا الفندق: خدمة الغرف على مدار الساعة, مرافق مخصصة لذوي الاحتياجات الخاصة, تسجيل وصول/خروج سريع, تخزين الأمتعة, واي فاي في المناطق العامة. تتضمن كل غرف النزلاء وسائل الراحة والتسلية المصممة خصيصاً لضمان الراحة القصوى للضيوف. يمكنك طلب اللائحة الكاملة للخدمات في الفندق ومن بينها حوض استحمام ساخن, مركز للياقة البدنية, ساونا, حمام سباحة خارجي, سبا. مهما كانت أسبابك لزيارة المدينة، فإن Sheraton Grand Mirage Resort, Gold Coast هو الخيار الأفضل لإقامة مثيرة وممتعة. يفرض العقار وديعة أمان مرتجعة لتغطي الرسوم أو الأضرار التي تحصل خلال فترة الإقامة. قيمتها تختلف حسب طول مدة الإقامة و / أو حجم الغرفة المحجوزة. يرجى الإتصال بالعقار للحصول على معلومات أكثر. Nice facilities, nice room. Friendly staff. We recently shouted our parents to a night at the Sheraton Gold Coast. Upon payment on Agoda, we realized that the payment was made directly through the hotel, and there was a credit card fee that amounts to about 2% (Most hotel don't online). On booking, it was stated on the website that there is in room Wifi (which was not the case when we checked in), not sure if that is Agoda or hotel issue. The spa (which we paid an extra $60 for) in the spa room was not working. On a positive note, the room was spacious, well appointed. The carpet and walls look tired, but clean. The bathroom was nice and clean and as mentioned before, has a nice spa which was not working. Our parents are elderly so did not use the hotel facilities much. However, I do know that it has an extensive and beautiful swimming pool, nice restaurants and has its own private beach. All in all, Sheraton Gold Coast is a nice hotel, a little out dated and pricey. Staff service was average. Better value elsewhere. We loved everything about this hotel. Staff was welcoming, we got there at 12.15pm the room was ready. Also got a free upgrade to a studio spa room. The room was clean, very comfortable bed and pillows. Easy access to the beach. Nice cocktails at pool bar. Loved the buffet breakfast, even got a discount! We will definitely be back. Thanks guys. It's the little things that make a BIG difference. Ordered my favourite cocktail from the pool bar, and it has grapefruit in it. Well, the don't have grapefruit. Huh? This is the Sheraton. Decided on a Mai Tai but they only have fake Curaçao. Went for it against my better judgement and it was awful. Drinks are not cheap here, this is supposed to be a 5 star hotel so no excuse. Have traveled the world and have never seen a worse stocked bar. The water cooler around the pool was not brought out until 10:30 each morning, then after it was empty, was never refilled all day. Tried to get a glass of red wine at the pool bar, but they only sell it by the bottle. Are you kidding?? The location and rooms are lovely, but if you can't even get a drink that you want around the pool, it just kind of ruins the whole experience. Spent 4 days there, and we would have dropped a lot at the pool bar, but as we couldn't get a drink we liked, just went elsewhere. Aw some property but they are missing the boat. The little things matter. Location is great with a mall across the walk bridge. Close to Sea World. Very clean. love the private beach and pool. Staff is very friendly and professional. The Sheraton Gold Coast in our view has to be one of the nicest properties around. elegantly and tastefully decorated, beautifully positioned and so very well run. We stayed in a lagoon view room, which was private and beautifully appointed. Breakfast was fantastic, and as always the combination of pool and beach was appreciated by our kids. Well worth the money and highly recommended. 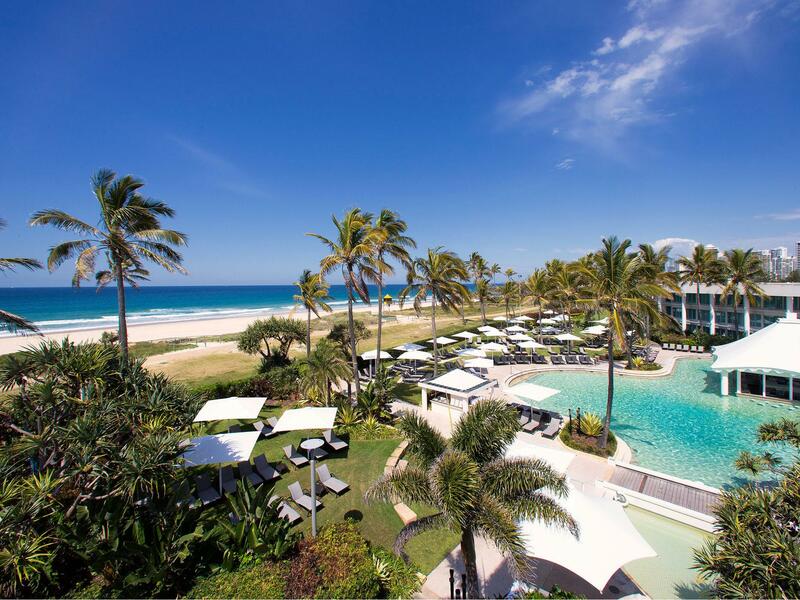 One of the best resort you have on Gold Coast. Not saying much because most of them are terrible. However breakfast is excellent, room are great and proximity to the beach is a big plus. Excellent service and very good facilities at the Sheraton Mirage. Great pool and hotel backs onto patrolled beach. Rooms are fine, probably a bit dated, but adds to the appeal. Corridors can be noisy with other guests walking past and making noise which disturbs your peace in the room. We wish the pool water was a bit warmer. Not happy, smell of urine on blanket, reception called me at 10 pm when sleeping and my credit card was hacked that night.